Church Theme: “Building Life Together” Prayer/Bible Studies Wednesdays, 6:30pm Children: “Stories of Jesus” . Youth: “Explorers: Luke and Acts” Adults: Roundtable Bible Conversation groups. HISTORY: Begun as an outgrowth of a religious survey through door to door outreach in Bedford in August 1955, the First Baptist Church of Bedford met for the first time in the old Bedford Library on Sunday, May 27, 1956, with 30 persons present. Rev. Howard Joslyn, Director of Evangelism for the Massachusetts Baptist Convention, conducted services and performed other pastoral duties. A Dedication Service program from October 1956 listed 41 charter members. The present church site was purchased in September 1956 and included the parsonage which was used for the sanctuary and Sunday School. Rev. Harold Pillsbury, Chaplain at Metropolitan State Hospital, was acting pastor from October 1956 to April 1957 when the first permanent pastor, Rev. Arthur Foye, was called here. To serve the growing church, the building of a small chapel (now known as the “Connections” Building) began in October 1957, and the first worship service there was held Christmas Sunday 1957. The groundbreaking of the present sanctuary, and main building, took place in March 1962, and the first service there was held in December 1962. Since then, First Baptist has grown to be a multi-cultural and multi-racial church family. We value our God-given diversity while maintaining Spiritual Unity in Jesus Christ. We are involved in proclaiming the gospel of Jesus Christ through daily lifestyle and evangelism, this including involvement in social justice issues, human dignity, and racial reconciliation. We support the work of missionaries throughout the world, and are personally involved in concerns within our community and city. We are growing to discover what God is doing in our neighborhoods, community and church. BELIEFS: WE CONFESS JESUS CHRIST as the Son of the Living God, our Lord and Savior. We are joyously united in our common task of sharing the whole Gospel with the whole world. WE BELIEVE IN THE BIBLE as the divinely inspired word and record of God's actions in history, and we believe it is a trustworthy, authoritative, and all-sufficient rule of faith and practice. WE BELIEVE that all have sinned and fall short of the glory of God, and we believe Jesus died to save us from our sins. Those of us who believe this are forgiven by God and enter into a new life. WE BAPTIZE believers by immersion. We regard "believer's baptism" as a symbol of death and resurrection. The old life of sin and separtion from God is replaced by the new life of Spirit that is reconcilied with God and one another. WE CELEBRATE the Lord's Supper (or Holy Communion) in memory of the saving grace given by God through Jesus Christ and His sacrifice on the cross for our sins. We practice "open Communion," and invite all believers to examine themselves and then participate in this celebration. are called together to be a family of disciples; witnessing at home and throughout the world to the saving grace of Jesus Christ, and calling upon all to act justly, to love mercy, and to walk humbly with their God. Church Covenant First Baptist Church of Bedford, Massachusetts In response to the love and guidance of God and our Lord and Savior, Jesus Christ, we do solemnly and joyfully make this covenant with each other. We will, by the power of the Holy Spirit, walk together in Christian love, exercising care and watchfulness over each other so that we may participate in each other’s joys, help bear one another’s burdens and sorrows, and faithfully warn and encourage one another in all things. We will faithfully meet together and strive to promote the spiritual life, harmony and prosperity of this church by prayer and study of the Scriptures. We acknowledge the claim of the church upon our loyalty and devotion, and pledge to sustain its worship and programs by our attendance, personal service, and financial contributions. We pledge ourselves to bear witness to the power and love of Jesus Christ in our lives, and to aid in proclaiming the Gospel here and throughout the world. We will be faithful to educate ourselves and our children in the knowledge and love of God so that His spirit may be seen in all our relationships, and so that we may live to the glory of Him who has called us out of darkness into His marvelous light. Amen. The First Baptist Church of Bedford is affiliated with the American Baptist Churches, USA and The American Baptist Churches of Massachusetts. Each church governs its own life and practices while working together toward the common mission of sharing the gospel of Jesus Christ to the world. While local churches may choose policies that we are not in agreement with, we hold that the Scriptures are the primary authority for faith and practice. HISTORY: Begun as an outgrowth of a religious survey through door to door outreach in Bedford in August 1955, the First Baptist Church of Bedford met for the first time in the old Bedford Library on Sunday, May 27, 1956, with 30 persons present. Rev. Howard Joslyn, Director of Evangelism for the Massachusetts Baptist Convention, conducted services and performed other pastoral duties. A Dedication Service program from October 1956 listed 41 charter members. The present church site was purchased in September 1956 and included the parsonage which was used for the sanctuary and Sunday School. Rev. Harold Pillsbury, Chaplain at Metropolitan State Hospital, was acting pastor from October 1956 to April 1957 when the first permanent pastor, Rev. Arthur Foye, was called here. 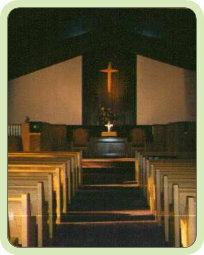 To serve the growing church, the building of a small chapel (now known as the “Connections” Building) began in October 1957, and the first worship service there was held Christmas Sunday 1957. The groundbreaking of the present sanctuary, and main building, took place in March 1962, and the first service there was held in December 1962. BELIEFS: WE CONFESS JESUS CHRIST as the Son of the Living God, our Lord and Savior. We are joyously united in our common task of sharing the whole Gospel with the whole world. WE BELIEVE IN THE BIBLE as the divinely inspired word and record of God's actions in history, and we believe it is a trustworthy, authoritative, and all-sufficient rule of faith and practice. WE BELIEVE that all have sinned and fall short of the glory of God, and we believe Jesus died to save us from our sins. Those of us who believe this are forgiven by God and enter into a new life. WE BAPTIZE believers by immersion. We regard "believer's baptism" as a symbol of death and resurrection. The old life of sin and separtion from God is replaced by the new life of Spirit that is reconcilied with God and one another. WE CELEBRATE the Lord's Supper (or Holy Communion) in memory of the saving grace given by God through Jesus Christ and His sacrifice on the cross for our sins. We practice "open Communion," and invite all believers to examine themselves and then participate in this celebration. are called together to be a family of disciples; witnessing at home and throughout the world to the saving grace of Jesus Christ, and calling upon all to act justly, to love mercy, and to walk humbly with their God. Church Covenant In response to the love and guidance of God and our Lord and Savior, Jesus Christ, we do solemnly and joyfully make this covenant with each other. We will, by the power of the Holy Spirit, walk together in Christian love, exercising care and watchfulness over each other so that we may participate in each other’s joys, help bear one another’s burdens and sorrows, and faithfully warn and encourage one another in all things. We will faithfully meet together and strive to promote the spiritual life, harmony and prosperity of this church by prayer and study of the Scriptures. We acknowledge the claim of the church upon our loyalty and devotion, and pledge to sustain its worship and programs by our attendance, personal service, and financial contributions. We pledge ourselves to bear witness to the power and love of Jesus Christ in our lives, and to aid in proclaiming the Gospel here and throughout the world. We will be faithful to educate ourselves and our children in the knowledge and love of God so that His spirit may be seen in all our relationships, and so that we may live to the glory of Him who has called us out of darkness into His marvelous light. Amen.